Historic Murphysburg Preservation’s mission is to promote historic preservation throughout the Murphysburg Residential Historic District and the City of Joplin. We seek to preserve the integrity of the downtown residential community, educate visitors about our rich history, save limited natural resources, and instill community pride. Information in this website is provided by Historic Murphysburg Preservation, Inc. and is accurate to the best of its knowledge. HMP collects historical narrative from The Murphysburg Survey, Post Art Library, Find a Grave, City Directories, Oral history accounts, History of Jasper County publication, Historic Joplin Blog, Joplin History & Mineral Museum, Ancestry website and newspaper articles. HMP welcomes additional documentation, oral history, and photographs. In 1992, the City of Joplin designated Sergeant Avenue from Second Street to Fourth Street as the “Murphysburg Residential Historic District.” At the request of homeowners in the adjacent neighborhoods, the City of Joplin expanded the historic district in 2004. The historic district encompassed Sergeant Avenue from First Street to Seventh Street and Moffet Avenue from First Street to Fourth Street. Rosin, an architectural firm conducted the Murphysburg survey in 2015. The Missouri Advisory Council on Historic Preservation voted to place Murphysburg Historic District on the National Register of Historic Places later that year. Historic Murphysburg Preservation, Inc. was formed in 2005 for the purpose to implement charitable and educational activities that promote and stimulate historic awareness throughout the neighborhood. HMP, Inc. is a non-profit 501(c) (3) corporation governed by a volunteer board consisting of seven people. President, Vice President, Secretary, Treasurer and three directors . The organization is dedicated to the preservation of historic homes in Joplin’s only designated residential historic district. Past and present board members are personally and financially invested in historic preservation via historic home and business ownership. Their board members are involved in the City of Joplin Historic Preservation Commission, Missouri Preservation Board, Joplin History and Mineral Museum Board, Convention and Visitors Bureau Advisory Board and Ozark Gateway Association of Realtors. Many members have higher education ranging from construction to business and history degrees. 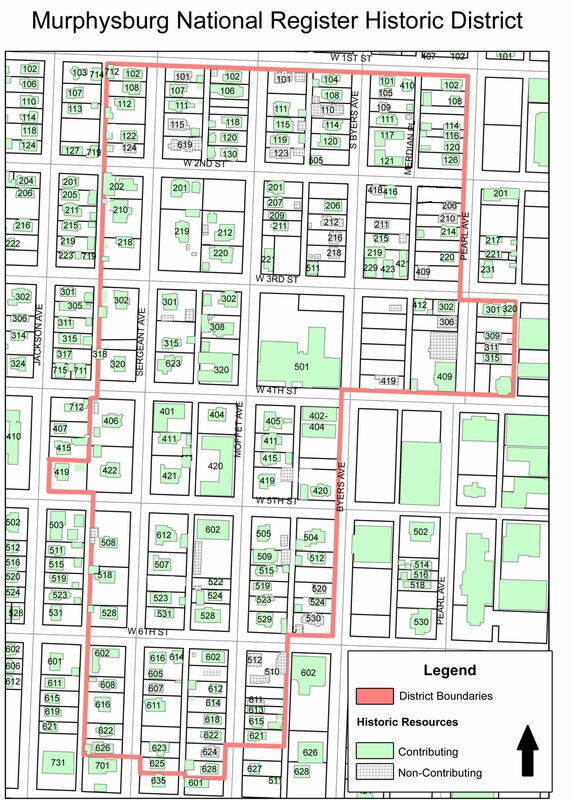 The Murphysburg National Register of Historic Places is roughly fifty-three-acre district that is comprised of thirteen full blocks and nine partial blocks roughly bounded by West First Street on the north, Pearl Avenue and Byers Avenue on the east, West Fourth Street and West Seventh Street on the south, and the rear (west) property line of resources fronting South Sergeant Avenue on the west. Operational funding: HMP does need to maintain enough cash reserve for ongoing expenses such as liability insurance, post office box rental, various dues, website maintenance, and more. Because HMP does not need to maintain a large cash reserve for office space, overhead, salaries, etc., we do not differentiate ourselves from competitors or similar organizations. HMP also takes advantage of Square and Pay Pal for payment of event tickets, vendor booths, dues, and donations. In order for HMP associates to comply with the mission statement, educational activities and events will continue in a professional, safe, and low-risk manner. Our insurance agent will be consulted during the planning process. HMP will document the process of acquiring licenses, bonds, liability insurance certificates, and liability waiver agreements, as needed, from contractors, venues, homeowners, ticketed guests, co-sponsors, co-hosts, etc.